This is an extraordinary surname, one of the rarest and most unusual that we have ever researched. It seems to be locational and to be recorded only in the area of the former West Riding of Yorkshire, and specifically in the town of Rotherham and the city of Sheffield. The spelling and appearance would suggest a Germanic influence. Certainly it looks nothing like any English spellings, and the German authorities in the 18th century encouraged the adoption of what became known as 'ornamental' surnames. These were surnames which looked locational, but were usually totally abstract and meant to describe the glories of nature. Examples of the genre being Greenberg (the green mountain), or Hagenback (the hedge by the brook). 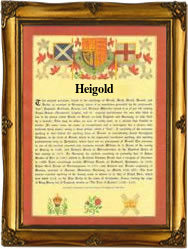 'Heigold' appears as if it might have been 'Heilgeld' (holy gold) or similar, which would have been fine except that research has not found such a German name! Furthermore the earliest recording that we have been able to find, that of George Henry Heigold, who married Mary Lunt at Rotherham, on Christmas Day, 1844, appears to be quite 'English'. There is no suggestion of a foreign influence in the personal names of George Henry. Later the surname appears on several occasions in the register of the church of St Phillips, Sheffield. An example being that of Florence Heigold, who married George Albert Mills at St Phillips on May 16th 1881.